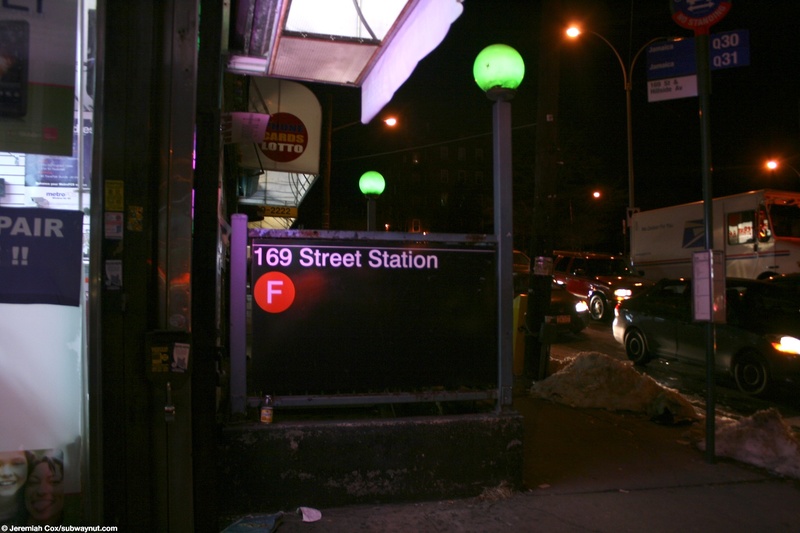 169 Street is the second to last stop on the F train as it continues out to it's terminal at Jamaica-179 Street. 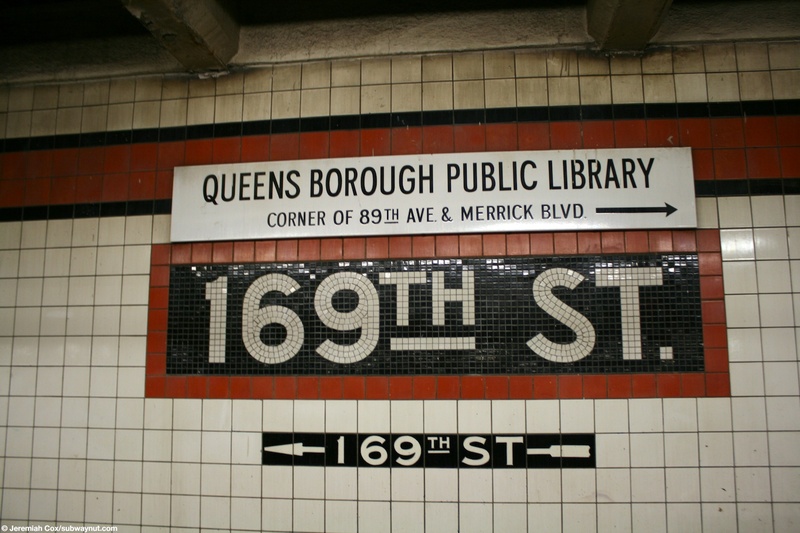 The station is a typical local stop on the Queens Blvd Line. 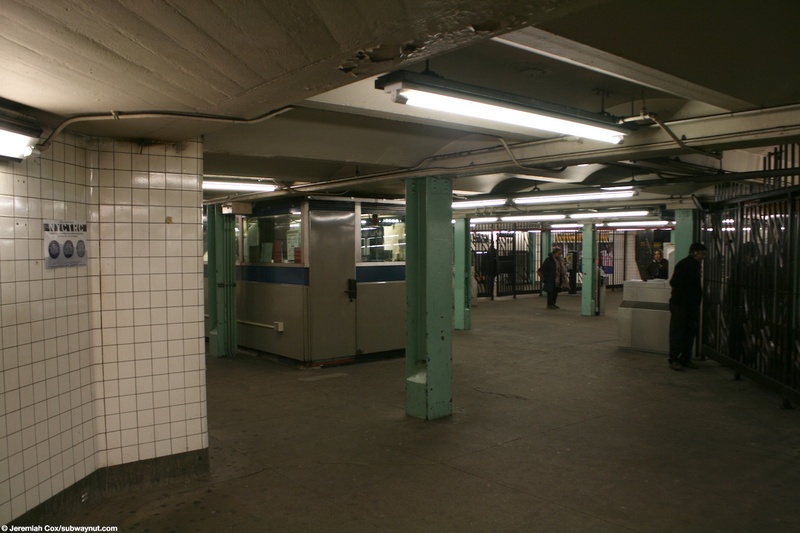 There are two side platfroms and a full length mezzanine, that is still basically intact (unlike many IND Station mezzanines that have had there mezzanines largely converted from public use to other non-public MTA employees only uses) except for it getting narrower towards it middle between the two exits (each still has turnstiles) some rooms have been carved out of the mezzanine over the Manhattan-bound platform. 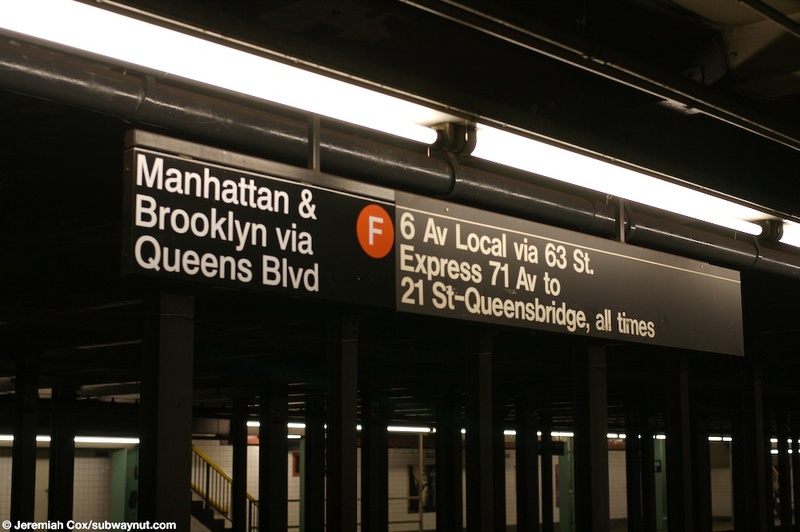 So there are many more staircases down to the 179 St-bound platform than the Manhattan-bound one. 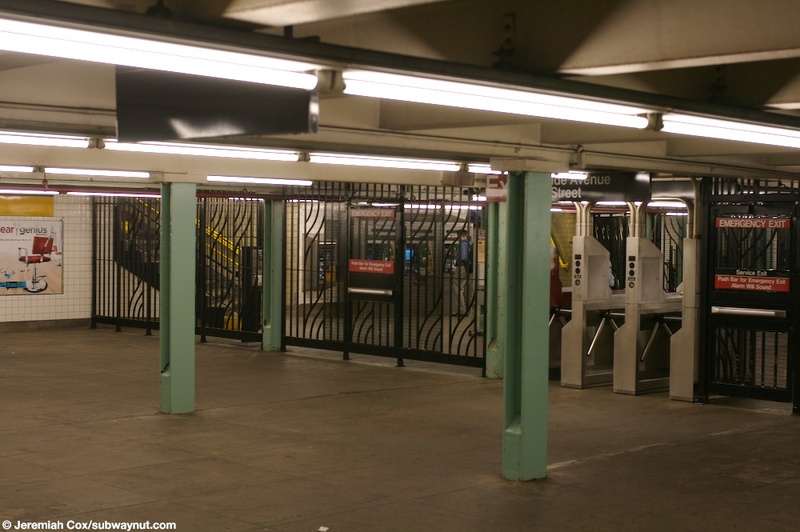 All of the staircases up from the 179 St-bound platform have strange metal railings framing the staircases almost attempting to force people up them to the mezzanine, this makes the platform quite a bit narrow in those situations. 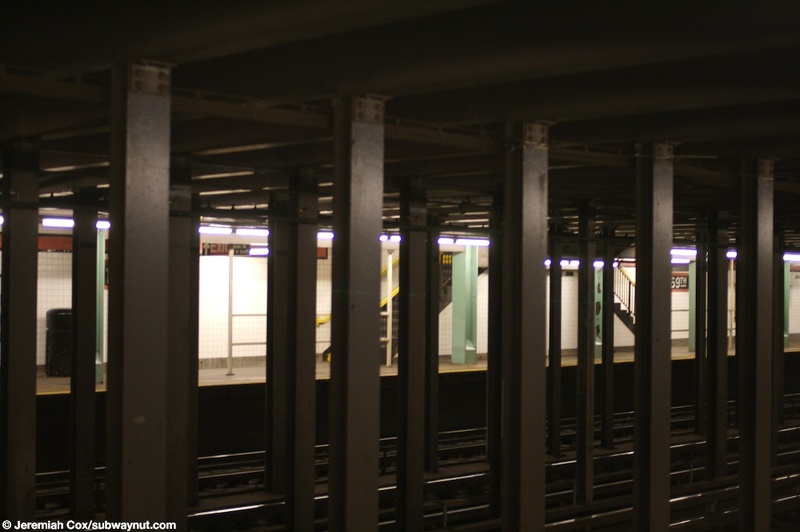 If you get off a train in front of one they just make the platform narrower. Many on the mezzanine are off the quite narrow veriety. 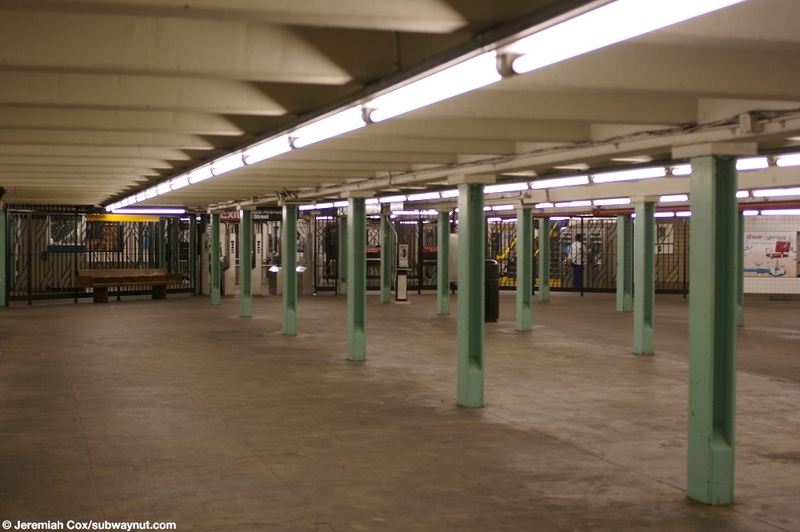 All the station columns have been painted in the lime green color that doesn't really match the orange trim along the platforms with a black border or the white lettering on black with an orange border that is the tiling of the name tablets. 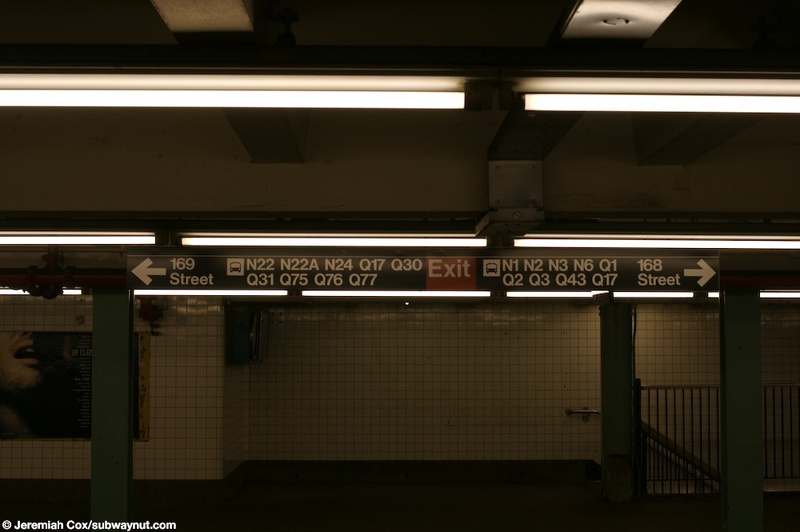 For exits the station has two, starting from the western end of the station four street stairs from all four corners of Jamaica Avenue and 168 Street lead down to small intermediate landings before shorter, wider sets of stairs lead down to the fare control area at the end of the full length mezzanine. 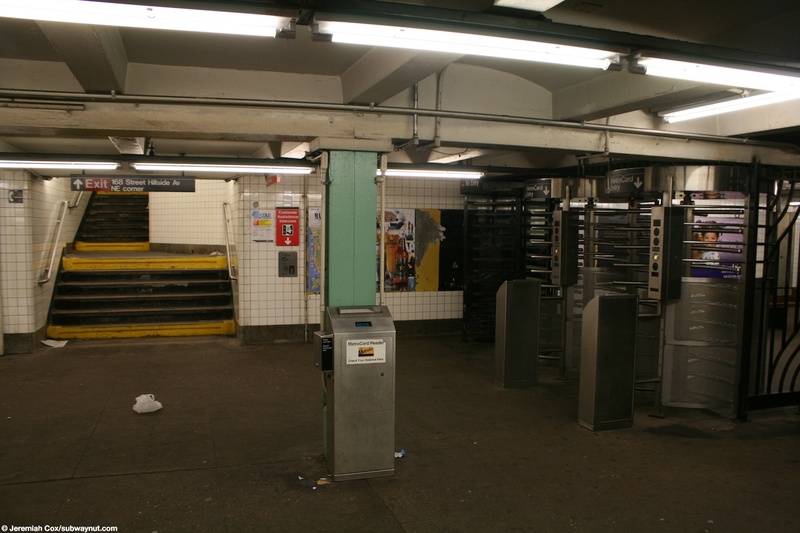 This fare control area is now unstaffed with an abandoned CSA booth and has both standard and high turnstiles, leftover from when the turnstiles were part time. 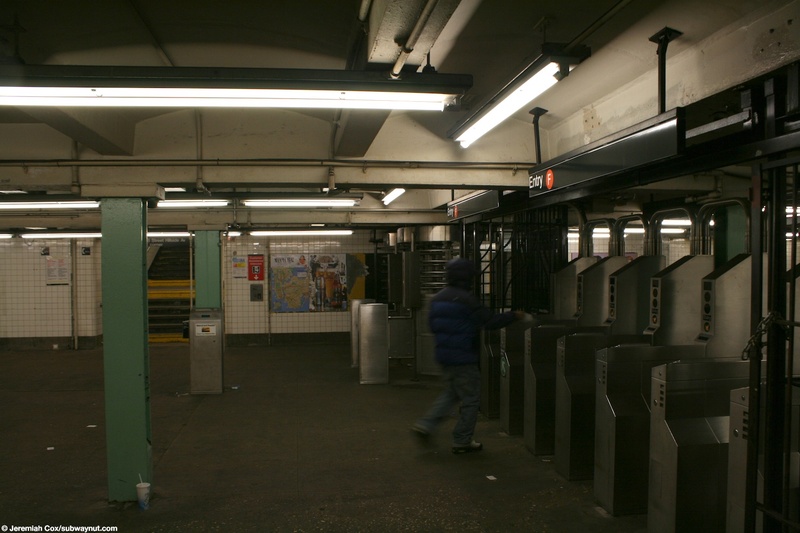 The second full time fare control area is towards the eastern end of the station, four street stairs (all arriving at odd angles onto the portion of the mezzanine outside of fare control after their small intermediate landings) from all four corners of 169 Street and Hillside Avenue. 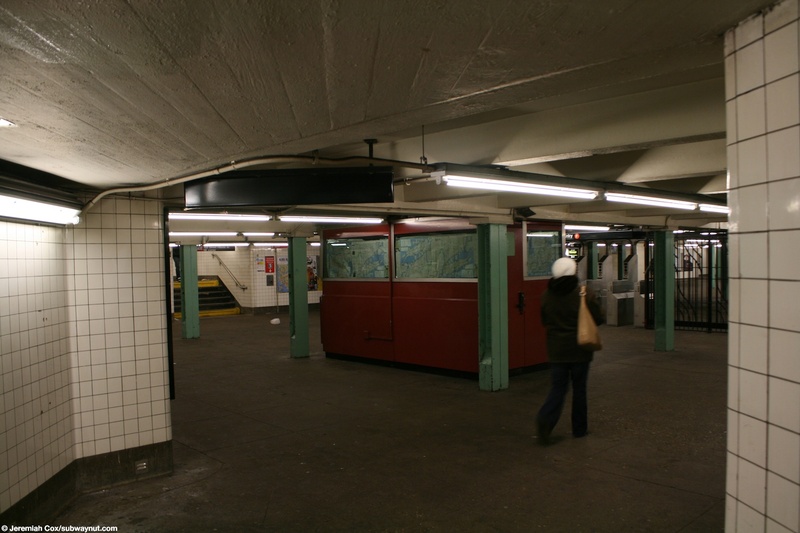 One is signed for Hillside Avenue and Homelawn Street because that street crosses into this intersection at an odd angle and ends This fare control area has two separate banks of turnstiles on either side of the token booth, one back leads west and to the main long mezzanine area inside fare control, the other leads to its own extension of the mezzanine at the eastern end of the platform with a single staircase up from the Manhattan-bound platform and an unusual two staircases from the 179 St-bound platform where the two staircases up from the platform meet on a slightly lower landing before a tiny staircase continues up to the mezzanine, all beneath 'Do Not Jump' painted on the tiles above. 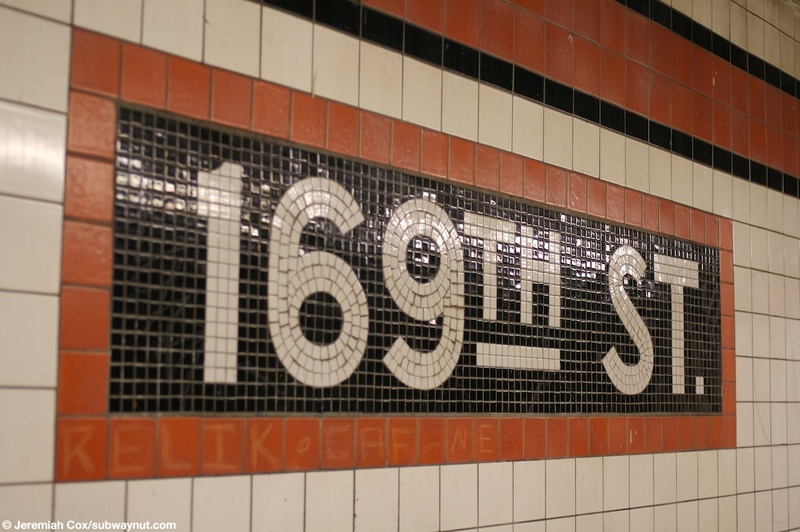 (169f1) A name tablet at 169 Street. 2 June, 2008 (169f2) The small 169 text a tile below the orange trim with a black border. 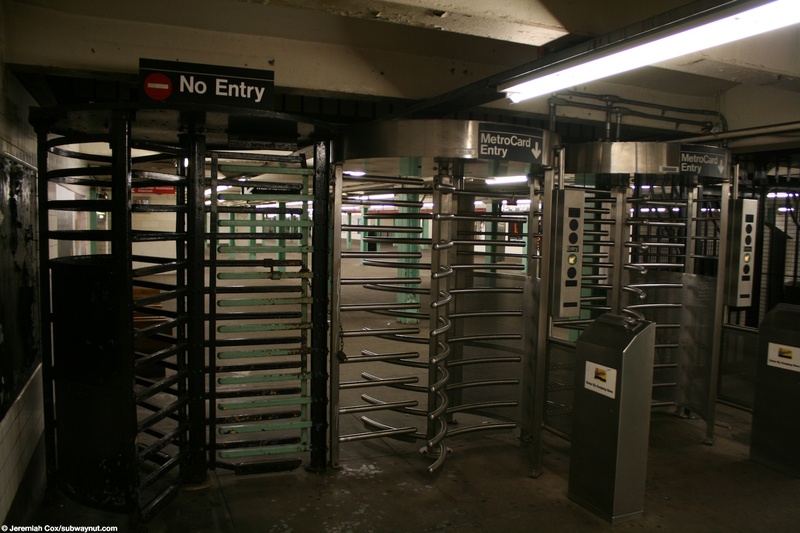 2 June, 2008 (169f3) Looking across the basically unused express tracks to the other side platform at 169th St.
(169f5) A view of the turnstiles to 169th St on the long full platform length mezzanine 169th St has. 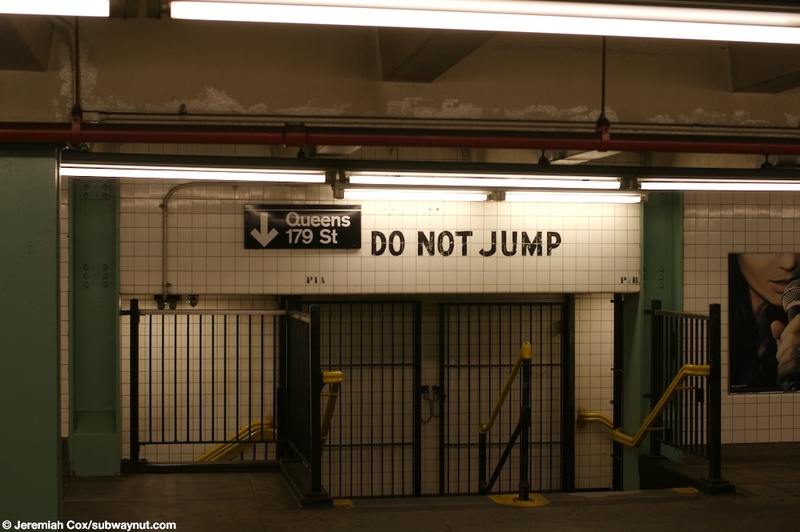 2 June, 2008 (169f6) Very old DO NOT JUMP text is still just above a staircase down to the Queens 179 St platform at 169 St.
2 June, 2008 (169f7) A name tablet that has an old black text on white Queens Borough Public Library sign above it and the standard IND station text pointing to an exit below it. 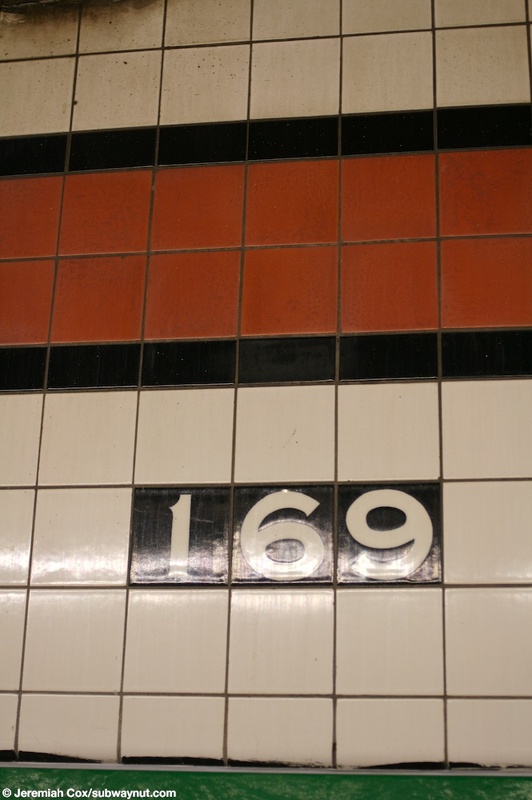 5 January, 2011 (169f8) Another view on the very wide and spacious, largely unused mezzanine at 169 St.
(169f9) A sign on the mezzanine pointing to the two exits at 169 Street and 168 Street that includes all the connecting bus lines that stop at the station. 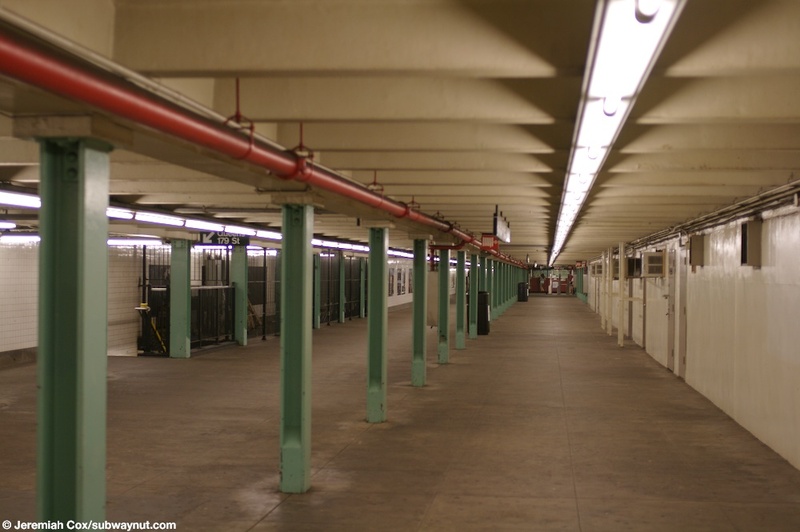 2 June, 2008 (169f10) Another view down the full station mezzanine at 169 Street, for have of it non-public rooms have been built over some of the staircases on the Manhattan-bound platform closing them.